Category: Blankets and Throws. Tags: gift, hand finished, Moroccan blanket, Moroccan handira, Moroccan handira blanket, Moroccan wedding blanket, Morocco, one of a kind, preservation traditional craft, Wedding gifts. 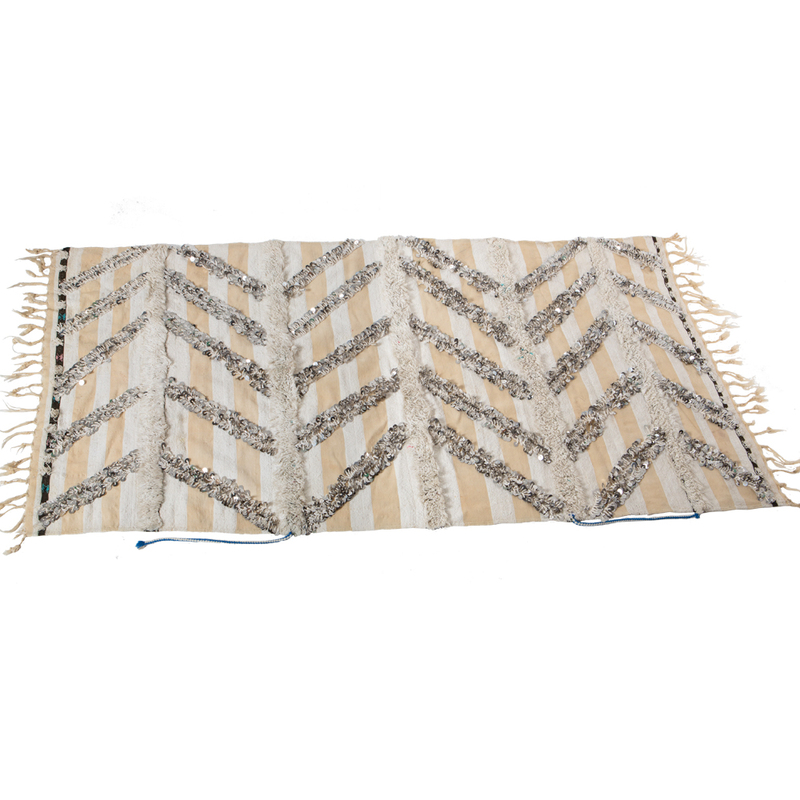 Moroccan handira or wedding blankets are perfect for adding a touch of glamour to a room. They were originally hand-woven by the female relatives of a bride for her wedding day and were worn like a cape tied around the neck. Each wedding blanket features a different design reflecting the creativity of the weavers. This unique wedding blanket is hand-woven in wool and cotton in a neutral colour palette of creamy white and beige stripes with white cotton fringing. 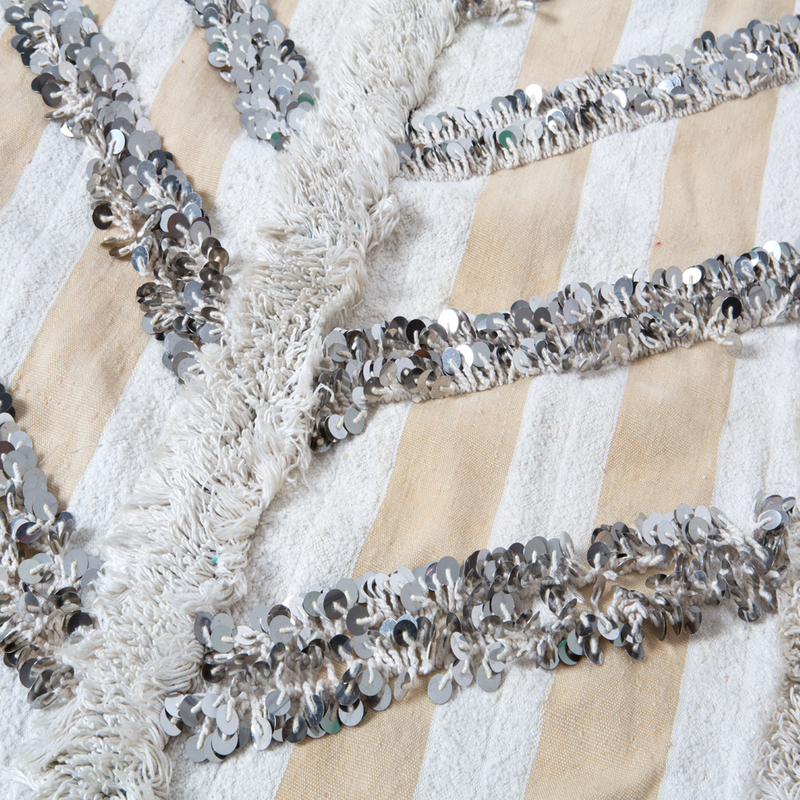 The design is geometric, featuring zig zags of sequins crossing the blanket and lines of cotton fringing. Scroll over the images to see the design in more detail. Use as a throw over the foot of a bed or over a sofa, chair or headboard to add a touch of glamour, texture and sparkle. Please note this is a vintage hand woven product so there may be imperfections but we think this adds to its charm.